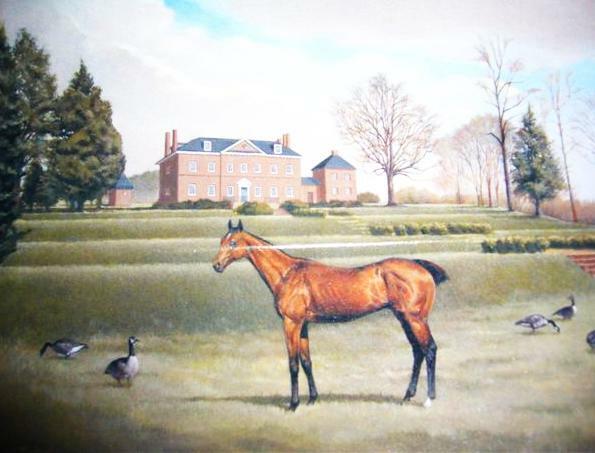 Selima at Ogle's Belair estate in Maryland gave birth to ten foals after her racing career was finished. She dominated the breeding of her time. 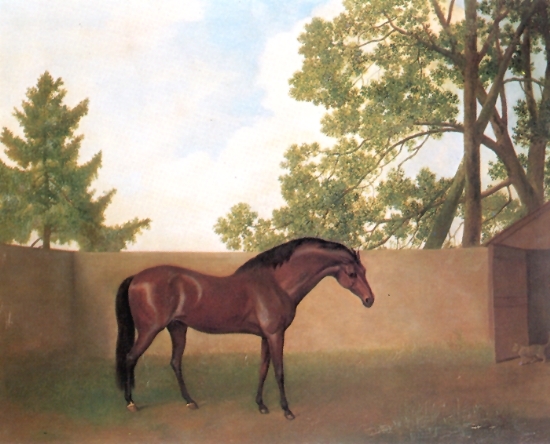 Godolphin Arabian painting by George Stubbs 1792. Godolphin was one of the three stallions to which all Thoroughbreds trace their ancestry. He sired Selima, who was born in 1745 at the second Earl of d Godolphin's stud farm in England. Before the American Revolution, no Thoroughbred did more for racing's growing popularity than a plucky mare named Selima. At 24 years of age, William Byrd III presided over a vast Virginia estate that included Westover, a prosperous tobacco plantation on the James River. He possessed a round face, soft eyes, immaculate public manners and a new toy-a horse named Tryal he had just imported from England. Byrd was also an insatiable gambler captivated by dice, cards, horse racing, billiards, backgammon, lotteries-anything an American colonist could bet on in 1752. The young aristocrat wanted nothing more than to show off his new horse and, at the same time, make a gambling score, the bigger the better. His flamboyant urges resulted in the first historically significant Thoroughbred horse race on American soil: an epic five-horse, four-mile contest on a hilly Tidewater loam known as Anderson's Race Ground, held before a noisy swarm of racing fans in Gloucester, Virginia, near Williamsburg, on December 5, 1752. It was "in many ways the most important race of the colonial era," according to John Hervey, an eminent racing historian from the first half of the 20th century. It also foretold the fortunes of two of its principals-Byrd himself and a remarkable Thoroughbred named Selima. Byrd's grandfather had come to America from England around 1669 and parlayed an inheritance into a profitable fur-trading business. Byrd's father collected books and wrote witty poems and intimate diaries, founded Richmond, built a breathtaking Georgian mansion at his Westover plantation in Virginia and increased the Byrd fortune through land speculation before his death in 1744. Young Byrd wanted to maintain the family's place in society, and he seemed well on his way. He was already a justice of the peace and had been elected to Virginia's governing House of Burgesses, following in his father's footsteps. He relished displaying his wealth, the more ostentatious the better. While commanding a military unit at a remote outpost several years later, he received a wagonload of wine, coffee, brandy, soap and chocolate, enabling him to maintain his abundant lifestyle in difficult circumstances. "I think he thought he was the wealthiest man in the world, and he certainly behaved that way," says Marion Tinling, a historian who has studied the Byrd family correspondence. Running a horse in an important race was, Byrd believed, yet another way to emphasize his prominence. "That was what the wealthy gentlemen of the day did: they raced their horses against each other and staked their reputations on it," says Ellen Moyer, the current mayor of Annapolis, Maryland, a racing center during the colonial era. Neither Byrd's father nor his grandfather had raced horses, so the young aristocrat saw the Gloucester race as a chance to succeed on his own, apart from their enduring influence. But what he found more enticing was a chance to win money. He had taken up gambling when his parents sent him to London to study law at age 18. Sheltered as a boy in Virginia- his schooling took place at home because his parents feared exposing him to smallpox-he cut loose mightily once he was on his own. There was a story that he had lost thousands of pounds to the Royal Duke of Cumberland in a single sitting at a West End club. As popular as gambling was among England's privileged, Byrd was smitten beyond reason. When he returned to Virginia, he married the daughter of another wealthy tobacco planter, built a mansion on a hill near Richmond and started a family. When the mansion at Westover, where his mother still resided, was damaged in a fire, he rebuilt it with the finest materials and objects, including the most expensive billiards table in Virginia. But while he seemed the very embodiment of colonial gentry, sinister influences lurked inside. He would turn on his mother who doted on him, calling her "insane." And a French visitor to a Williamsburg tavern later wrote that Byrd was "never happy but when he has . . . Dices in hand." Gambling consumed him. At 24 years of age, William Byrd III presided over a vast Virginia estate that included Westover, a prosperous tobacco plantation on the James River. He possessed a round face, soft eyes, immaculate public manners and a new toy-a horse named Tryal he had just imported from England. Byrd was also an insatiable gambler captivated by dice, cards, horse racing, billiards, backgammon, lotteries�anything an American colonist could bet on in 1752. "He was an unfortunate man in many respects," says Tinling. "He had no head for business and didn't know how to manage his money. He didn't make very good friends. He didn't like his mother, who wanted the best for him. There was not a lot that went right." After importing Tryal around 1752, Byrd issued a challenge that was audacious even by his standards: he would put up 500 Spanish pistoles, an outrageous amount, for any horse in the land to race against Tryal, with the winner taking the entire purse. He used Spanish currency, the backbone of the shipping trade, but the gamble was colossal in any coin. One pistole was the cost of a cow. Five hundred could furnish a mansion or buy a dozen slaves. "The money on the table was phenomenal," says Stephen Patrick, director of the City of Bowie Museums, which include the BelairMansion and the BelairStableMuseum in Maryland. America in 1752 was a divided sprawl of Quakers and Puritans, Catholics and Dutch, Yankees and Southerners, Tories and slaves. More than a million people resided in what was still, in some ways, a brutal frontier, with disease claiming many children, Indians attacking the fringes, and pickpockets and horse thieves being put to death. But a sophisticated society was rapidly evolving as every year ships delivered more people and culture from England. There was theater to enjoy, newspapers to read and postal routes for the mail. The population was still too far-flung and disparate to agree on much, especially independence, an idea just beginning to percolate. But colonists from Rhode Island to the Carolinas could all agree that nothing was more heavenly than a fast horse. Racing in the New World dated to 1665, when New York's royal governor plotted a track on a Long Island plain shortly after the Dutch surrendered the territory. Until the 1720s, a typical race was a quarter-mile sprint between two horses, usually resulting from an argument between wealthy country gentlemen convinced they owned the faster horse. The men frequently rode their own horses, often grabbing and punching each other as they hurtled down narrow racing lanes surrounded by fans hurling bets back and forth. These bawdy affairs known as path races took place in front of taverns, on city squares or at country fairs. They were particularly popular in Virginia, Maryland and the Carolinas. A more sophisticated sport known as course racing had already sprouted in England by the early 1700s. Queen Anne opened the royal track at Ascot, and other racecourses followed. The typical race became a longer contest-four miles was the classic distance-between groups of horses competing for money and trophies. In the colonies, the sport soon took a similar evolutionary turn. America's first jockey club, composed of wealthy horse owners and breeders, was organized in Charleston, South Carolina, in 1734. Five years later, Williamsburg's Virginia Gazette heralded a race in which eight horses competed over a one-mile course, with a trumpeter's blast signaling the start and the winner earning 40 shillings. In wealthy Annapolis, whose inhabitants, it was said, were more British than the British, the highlight of the social season was a week of parties and plays organized around a racing meeting. In 1743, a silversmith was commissioned to make a trophy for the Annapolis Subscription Plate, a premier event of the city's September races. The prestige and money associated with racing success inspired breeders to try to produce speedier horses. British soldiers had long returned from desert battle fronts with stories of their opponents' astounding horses sprinting through the sand, so Middle Eastern sires were imported to England, leading to the foundation of a new breed, the Thoroughbred. At first known simply as blooded horses, these leaner, faster equines soon arrived in the colonies, attracting gawkers and vastly increasing interest in the sport. New oval tracks that gave spectators a better view further increased its appeal. Only the wealthy could pay for a horse to take a three month boat trip across the rough Atlantic, of course. Samuel Gist of Hanover County, Virginia, was the first on record to do it, bringing over Bulle Rock, a 21-year-old, in 1730. Bulle Rock was much too old to race, but Gist wanted him to sire a new generation of faster horses. Others who imported Thoroughbreds included Samuel Ogle, the royal governor of Maryland; Ogle's brother-in-law, Benjamin Tasker Jr., a young colonel in the militia serving Anne Arundel County, Maryland; and John Tayloe II, an avid horseman whose Mount Airy estate, in Richmond County, Virginia, later became a racing center. Byrd wanted to be included in such company, but his judgment in horseflesh was flawed in one important regard: Tryal "had not been a success when raced" in England, according to John Hervey. The chestnut horse was also, at 10 years old, long past whatever prime he may have once enjoyed. Byrd's challenge, as foolish as it was bold, attracted interest. Tayloe offered to put up a thousand pistoles and run two imported Thoroughbreds against Tryal. Another Virginian, Francis Thornton, entered a fast gray mare that had not been imported. Colonel Tasker sent word from Maryland that he would bring a mare named Selima. The race was thus worth 2,500 pistoles, an astonishing sum at a time when a racewinning horse typically earned about 30 pistoles. Tasker's decision to enter Selima incited passions in Maryland, where horse owners and breeders believed their racing was superior to Virginia's, an attitude their neighbors loathed. The colonies had battled over many issues, including rights to the Chesapeake Bay, and Selima's entry took on sizable symbolic weight. Like Byrd, Tasker was from society's pinnacle. His father was the mayor of Annapolis. His sister was married to Maryland governor Ogle. At 32, he was an Annapolis city councilman and served in the upper house of Maryland's colonial legislature. If contemporary paintings are a guide, Tasker was distinctively handsome with high cheekbones, a sharp nose and trim build. He would later represent Maryland at the Albany Congress, where the idea of colonial unity was first broached. "He was a popular man, and very active in political life," says Shirley Baltz, a historian in Bowie, Maryland, who recently relocated to New Jersey. But he was different from Byrd in that, as the grandson of a self-made man who came to America as an indentured servant, he did not take his wealth and comfort for granted. He had endured terrible despair-the deaths of five brothers before adulthood-and even his last name intimated a sense of purpose. When Ogle died in 1752, leaving a 3-year-old son as his primary heir, Tasker and his father assumed responsibility for the boy. Unmarried and childless himself, Tasker moved into Ogle's sprawling country estate, known as Belair, 15 miles west of Annapolis. Some might have perceived this as opportunism, but Tasker's profits from the arrangement were minimal; he used his own money on major improvements that raised the value of the estate for his nephew, Benjamin Ogle, who would later gain control of the property and become governor of Maryland in 1778. The Maryland Gazette described Tasker as "courteous . . . steady and sincere," and Benjamin Franklin, whom Tasker met at the Albany Congress, called him "amiable and worthy." Putting 500 pistoles on the line was not a decision to be made casually. But he accepted Byrd's challenge because he had faith in Selima and because his equine judgment, unlike Byrd's, was sound. At age 7, Selima was at the peak of her racing prowess. Abay mare with a faint white star on her forehead and a splash of white on her left hind ankle, she was the first preternatural talent to cross the Atlantic and race in the colonies. "She was the whole package," says Anne Peters, a pedigree consultant who is also editor of Owner-Breeder International, an equine magazine, and co-founder of the Thoroughbred Heritage racing history Web site. Selima's sire was one of three Middle Eastern horses that had started the Thoroughbred breed. Foaled in Yemen around 1724 and shipped through Syria and Tunisia, the stallion, known to history as the Godolphin Arabian, had found his way, the legend goes, to the royal stable of France's King Louis XIV. An Englishman named Edward Coke saw him in Paris, bought him and brought him back to England. After Coke died, the horse was passed on to Francis Godolphin, son of the lord treasurer to Queen Anne. Known as the Earl of Godolphin, Francis had a stud farm near the racing town of Newmarket. The Godolphin Arabian was bred with the earl's finest mares, one of which, a bay later known as Shireborn, could be traced to Queen Anne's personal stable. Shireborn delivered Selima on April 30, 1745, at the earl's stud farm. Tasker, in England on an extended visit, bought her for an amount lost to history. There is no record of her racing in England before being shipped to Maryland in September 1750. According to the earl's studbook, which was uncovered in the 1930s by C. M. Prior, an English pedigree expert, Selima was supposedly in foal-pregnant-when she was shipped across the Atlantic. "But there is no evidence that she produced a foal," Peters says. "She probably either lost it on the long trip across the Atlantic, or it died." Selima was trained to race at Belair in 1751 and 1752. "It may well have been that they said, 'Well, she's not in foal, so let's just put her in training and see what happens,'" Peters adds. Her racing debut was in Annapolis in May 1752. There, she defeated another English mare, Creeping Kate, winning 40 pounds, or about 50 pistoles. Her speed and heart were apparent. Described by Hervey as "one of those majestic matriarchs whose greatness is monumental," she was a more formidable racehorse than Byrd ever expected Tryal to encounter at Gloucester. Her trip to the race was painstaking. Belair was almost 150 miles from Gloucester, and she likely walked the entire distance, led by a succession of stablehands. "A horse seldom rode in a cart to a race in those days; for the most part, they were walked," says Tom Gilcoyne, a former historian at the National Museum of Racing and Hall of Fame in Saratoga Springs, New York. The horses belonging to Byrd, Tayloe and Thornton also were walked, but their trips were shorter; they were stabled just a few miles from the course. Few details of the race survive. The only known newspaper account was a brief report in Annapolis' Maryland Gazette listing the order of finish and referring to the occasion as "great." But racing historians can help set the scene. For instance, although the jockeys went unnamed, many in the era were young male slaves, Gilcoyne says. And the era's typical handicapping weight-the amount each horse had to carry- was 140 pounds (10 to 15 more than the best American Thoroughbreds carry today) including the jockey and his riding tack. Atrumpeter probably started the race. It takes little imagination to conjure up the rest of the day's images: the taciturn Tasker sitting on racing's version of an unbeatable hand at poker; the confident Byrd unaware that he had been caught in a trap he had set for himself; hundreds of spectators spread across the race grounds, making wagers and shouting loyalties to Maryland and Virginia. "A great rivalry between the states started that day," Annapolis mayor Moyer says. Selima won, followed by Tryal, Thornton's gray mare, and Tayloe's two imports, one of which later became a popular sire. The victory was monumental. Tasker and Selima were welcomed back as heroes in Maryland, having defeated not just the imprudent Byrd but all of Virginia. Selima's winning time went unrecorded, but the era's fastest horses covered four miles in about eight minutes. Today's best American horses seldom race longer than a mile and a quarter, the distance of the Kentucky Derby (though the Belmont Stakes, the last leg of the Triple Crown, is a mile and a half). Virginia's racing community was outraged at losing so much money to an imported horse like Selima. New Yorkers no longer allowed such imports, which they called ringers, to race in their colony, and Virginians somehow believed Tasker had duped them. (Never mind that three of the horses Selima defeated, including Tryal, also were imports.) They banned all Maryland horses from competing in Virginia. "It seemed the feeling in Virginia was, 'You took our money, a lot of our money, and we're not happy about it,'" Moyer says. Maryland breeders soon circumvented the ban by taking their pregnant mares to Virginia to deliver their foals, producing animals that were technically Virginia born and thus eligible to race there, even though they would be maintained in Maryland. Selima's victory was "the beginning of the competition between Maryland and Virginia," says racing historian Francis Barnum Culver, author of Blooded Horses of Colonial Days, a volume self-published in 1922. Selima was retired from racing after 1752, her colonial career as spectacular as it was brief, consisting of two victories in two starts. She proved even more estimable as a broodmare. Mated only with stallions imported from England, she produced ten sons and daughters, the first six for Tasker and four for Tayloe, who, when Tasker died in 1760, bought her for an unknown amount and moved her to Mount Airy. "Out of the ten, there was only one clunker in the bunch," says Owner- Breeder's Anne Peters. "Allot of people presume a great race mare is going to become a great broodmare, but the reality is it seldom happens. Selima was the best of both. She not only dominated in racing, she dominated the breeding of her time through her sons and daughters." "Out of all the mares that were imported in that era, she was the most influential." Her most famous son was Selim, a temperamental bay foaled at Belair in 1759. Sold as a yearling to Samuel Galloway, proprietor of the Tulip Hill estate near Annapolis, Selim began competing at age 4 and never lost until he was 9, then continued with few defeats until retiring at 13. In his greatest victory, a virtual replay of his dam's finest moment, he defeated Yorick, a Virginia-bred chestnut, in a Chestertown, Maryland, race that took place in 1766 when the local gentry raised 100 pistoles to lure what Culver called "the two most famous horses on this continent." Selima's offspring also included a succession of females that produced many generations of winners and champions. "For 50 years or more, whenever they gave the bloodlines of a horse, they would always try to track it back to Selima to prove its worthiness," says historian Baltz. "Selima's name appeared very frequently in advertisements long after she was gone. Hers was very much a special bloodline." Her direct descendants included Lexington, the greatest American sire of the 19th century; Foxhall, one of the best American-breds that ever ran in Europe; and Hanover, winner of 17 straight races, including the 1887 Belmont Stakes. "Her [pedigree] line continued to produce the greatest runners America ever had," Peters says. Much as Selima's abiding fame was prophesied in Gloucester, the race also augured Byrd's dismal fate. Undaunted by Tryal's defeat, he continued to import blooded horses and to breed Thoroughbreds, but he never took part in another major race. In 1756, he deserted his wife, with whom he had five children, and later took up with a daughter of a former mayor of Philadelphia. Climbing up a chest of drawers in their home, his still distraught wife, according to one source, was searching for letters she believed would confirm his adultery. The chest tipped over, crushing her to death. Byrd remarried and had ten more children, but he went deeply into debt after a tobacco glut led to a downturn in the market in the 1760s, and his hopes for recovery were undone by his gambling and expensive tastes. He put his holdings up for sale in a private lottery in 1768, but the return was disappointing. Pitifully, he thought the 1771 deaths of his mother and eldest son might save him, but he was largely ignored in their wills. "His family turned against him," says Tinling. "He had lost their respect." With his debts overwhelming and his credit gone, he added to his troubles by favoring moderation rather than independence before the Revolutionary War, further isolating him from colonial leaders with whom he had once collaborated in society, politics and war. On the first day of 1777, at age 48, distraught and deeply in debt, he shot himself dead. "His life was a series of unfortunate choices," says Tinling.